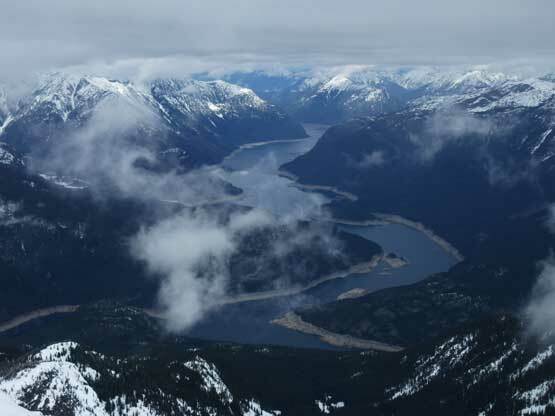 Ruby Mountain is a sizeable peak in the center of North Cascades that offers some of the finest views in its vicinity on a clear day. 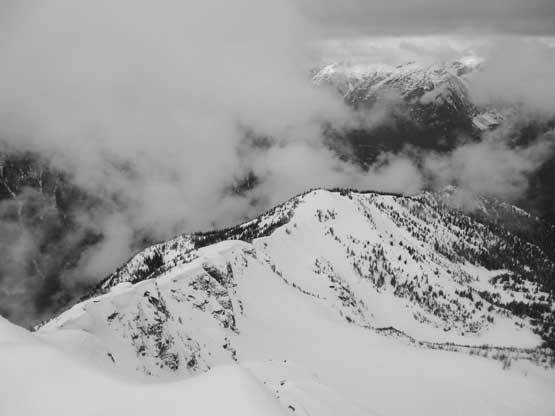 The peak is also a significant one in peak-bagging community as it’s the 21st most prominent summit in Washington state. 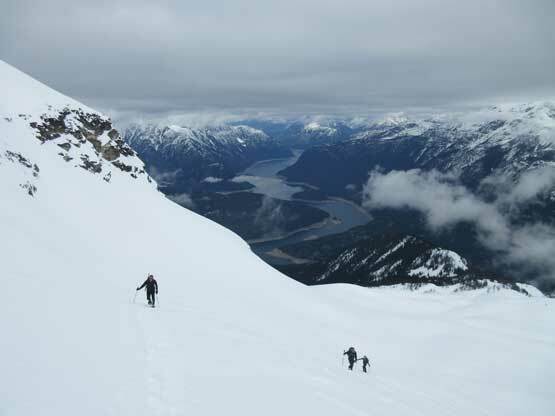 The ascent, though physically demanding, can be done year-round using several routes without too much of technical difficulties. 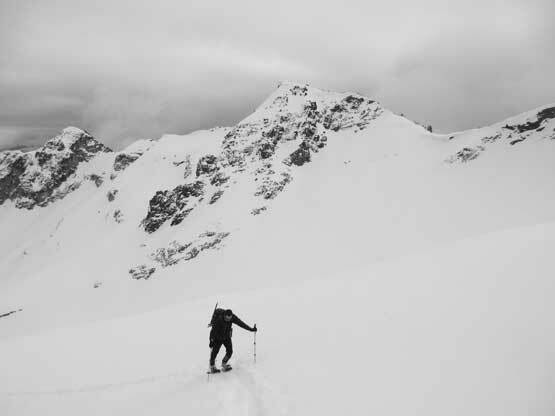 It seems like the south ridge from Fourth-of-July Pass is the most common summer route while the NW Ridge has also gained some popularity in these years. 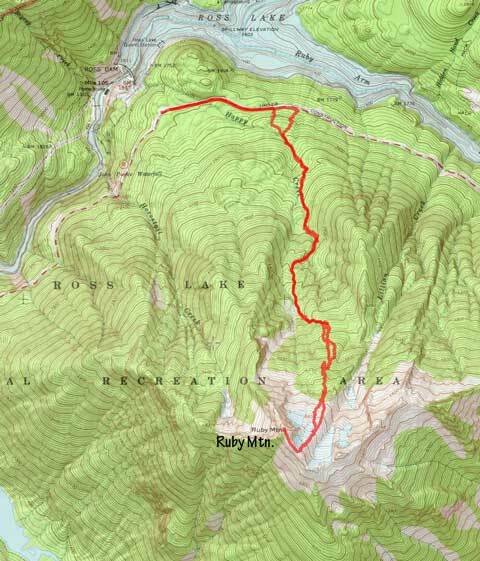 There exists a third option that roughly follows Happy Creek up the north slopes. 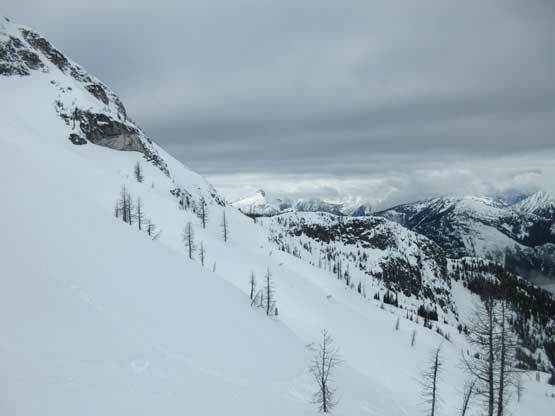 This route is fairly secret on the internet that one can hardly find any detailed beta, but skiers like it as it offers the most direct attack in winter months. In the right condition I personally would say a winter or spring ascent via Happy Creek is actually the least demanding way up Ruby Mountain. 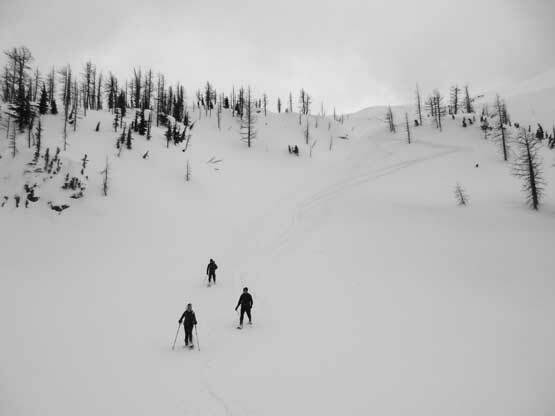 The only requirement of this route is a stable snowpack as it does travel through some steep terrain. 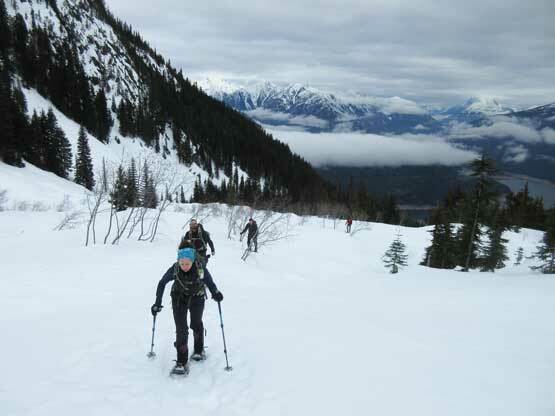 You do want to be in a decent shape as roughly 1800 vertical meters of snowshoeing or skinning is required. This past Tuesday had some reasonable weather forecast and on top of that I knew my friend Jake had just made an ascent a couple days earlier. 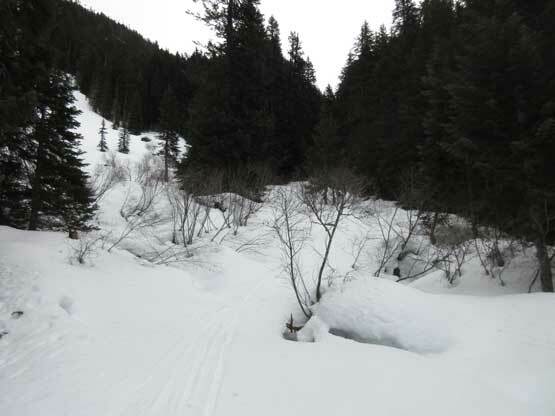 The snowshoe tracks were set and I also got a GPX file from him that it’s pretty much a no-brainer. To my surprise I actually managed to find three volunteers for this task. Vlad and I would come from Vancouver, British Columbia to join Natasja Y. and Trevor T. from Issaquah and Arlington of Washington state. We grouped in Burlington at around 5:30 am and an hour or two later we arrived at the trail-head by the winter gate of Highway 20. Apparently the weather forecast had undergone a last-minute downgrade that it’s going to be a mostly cloudy day instead, but it’s too late to make any change of plan. I did not come prepared with any “plan B” along this corridor nor am I familiar with the other objectives. There were only small patches of blue skies and we just had to hope for the best. From the closure gate we had to follow the road for about 1 mile. The snowshoes were strapped on right away. It’s arbitrary as where exactly to leave the road bailing into the bush but we had Jake’s GPX track to follow. 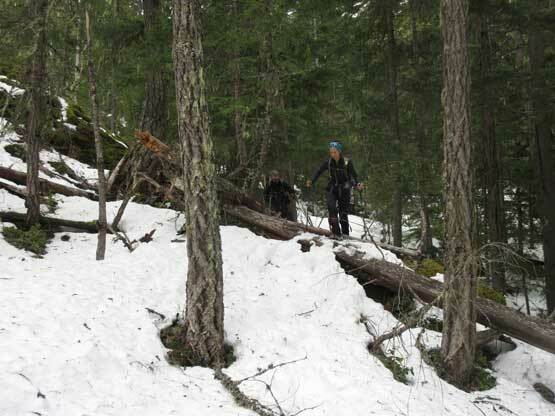 There’s about 15 minutes of bushwhacking with thin snow coverage but soon enough picked up previous parties’ tracks and the snowshoes were strapped on once again. The going was nice and easy in the lower forest without too much of post-holing. The route doesn’t really go up the creek but rather staying fairly to the climber’s left side. A couple steeper stretches were attacked by detouring to the left, but again we just had to follow the skin/snowshoe tracks. The grade eases off at around 1000 m elevation but then steepens again. The attack is again, on climber’s left side and we still had the tracks to follow. The snowshoe tracks were too faint but the skin tracks were clear enough. This section goes up on the edge of a slide path and then we traversed back climber’s right following a shallow gulch feature. 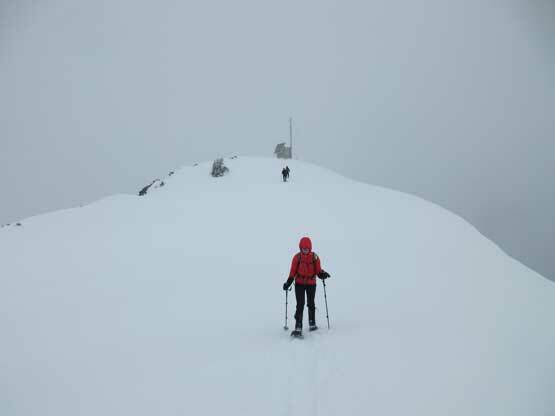 By this point the snow condition improved again and we had no further sinking-in afterwards. Upwards and onward we arrived at a meadow area with the upper mountain clearly visible in front. Too bad the weather was still overcast but at least the summit wasn’t soaked in. 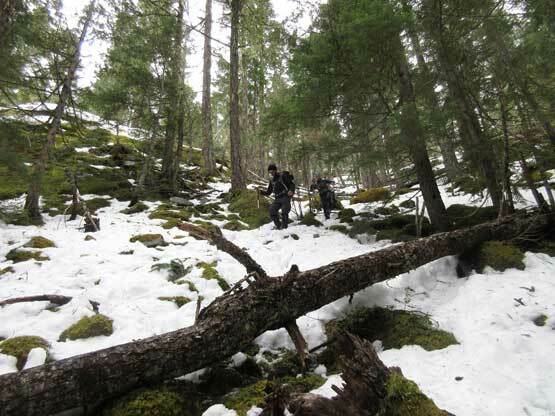 The next stage was a long stretch of steep ascent up thinning forest towards climber’s left side. The skin tracks had made route-finding and trail-breaking none-existent but I still have to say that the grade is steep and sustained. 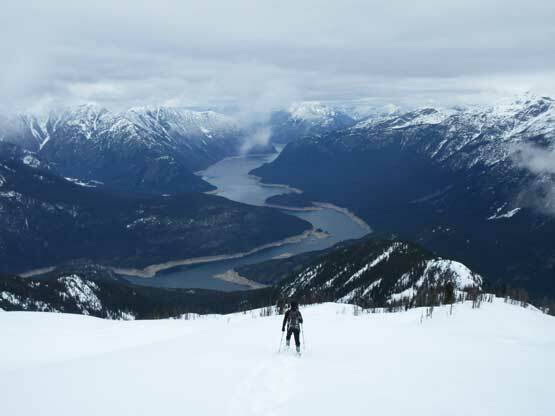 We were thankful to have the switchbacks despite being on snowshoes. This is just before that slide path section. Slowly transitioning into the alpine. The summit is visible now. Into the alpine the grade doesn’t ease off by much but the terrain opens up considerably. Looking back the best view is the full stretch of Ross Lake sticking northwards into Canada. 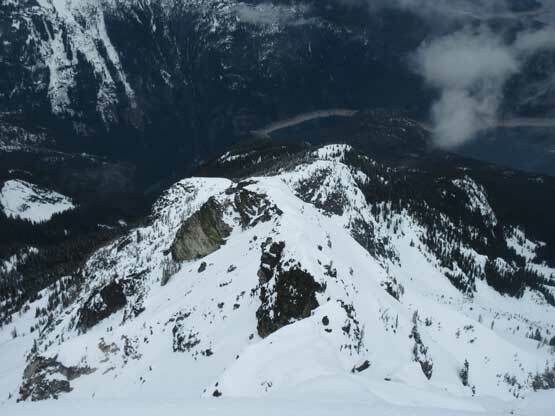 Looking upwards we could see a set of switchbacks ascending onto the SE Ridge with a huge cornice hanging besides. This stage is very foreshortened and the last part is steeper than appeared. 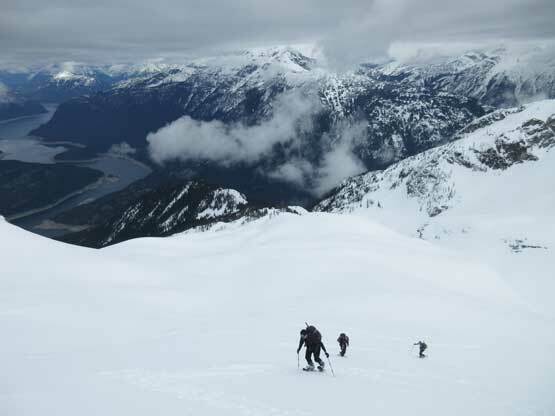 The final ascent along SE Ridge to the summit was easy but too bad again, the weather did not lift and we only had some partial views. Most of the distant peaks were engulfed in clouds we got absolutely no blue skies… Very disappointed about the weather forecasts but at least we weren’t in a white-out. 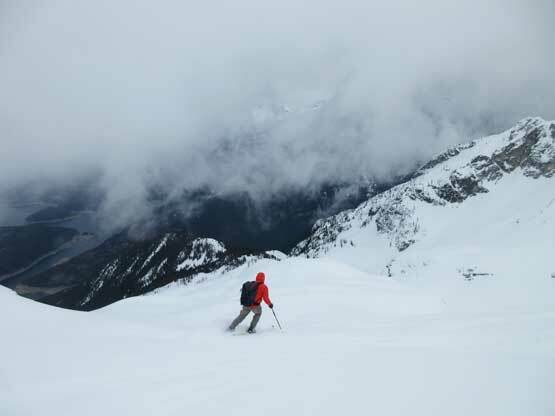 Ascending the rolling terrain in the alpine. 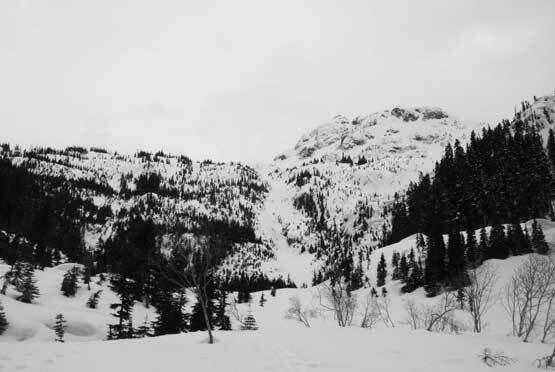 A sideways view looking west showing the slopes angle. This is one of my favourate shots from this trip. 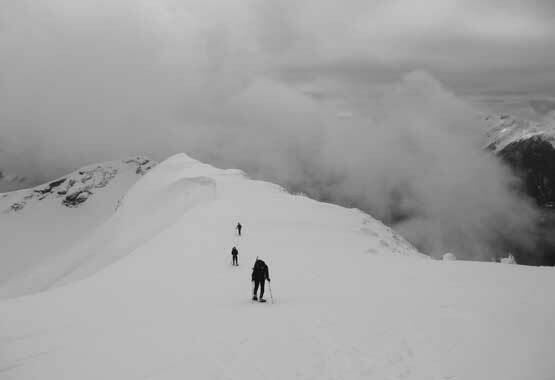 The last stretch slog on the uppermost SE Ridge. Partial Summit Panorama from Ruby Mountain. Click to view large size. Our group shot on the summit of Ruby Mtn. Photo by Trevor T.
We stayed for about an hour on the summit as for some reasons it wasn’t very windy nor cold. 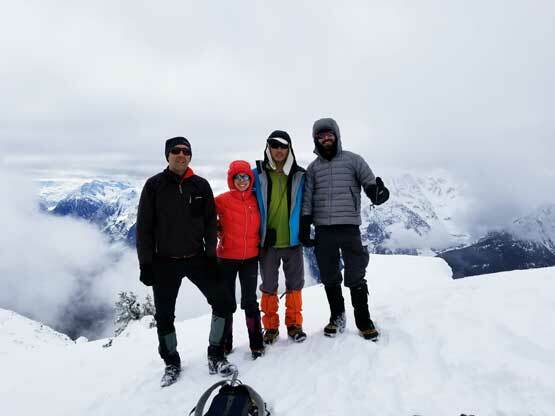 We were joined by an experienced skier who actually witnessed that catastrophic cornice fail on the same route last year (on the same date, oddly enough). We had some chatting and then descended at the same time. The skiing was apparently in a perfect condition but snowshoeing downhill was easy peasy for us too. In no time we were back to the treeline and then we did some shortcuts to get back down into the lower meadows. For the rest of the way we followed our uptracks except for the last stretch after taking the snowshoes off. Vlad led a line down a steeper roll but it worked nonetheless. Back to the road we had to put the snowshoes on again for the last mile’s slog. Natasja descending from the summit. 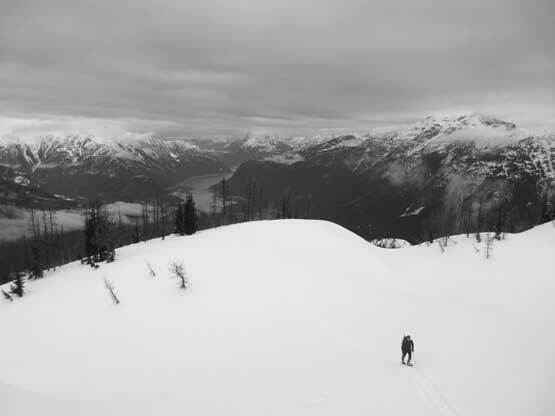 That solo skier enjoying his turns. In no time he’s off sight. Less fun for the last part. We had to take snowshoes off. Not enough snow, a bit bushy, steep and slippery..
Our round trip time was under 7.5 hours and this was surely a faster pace than expected. 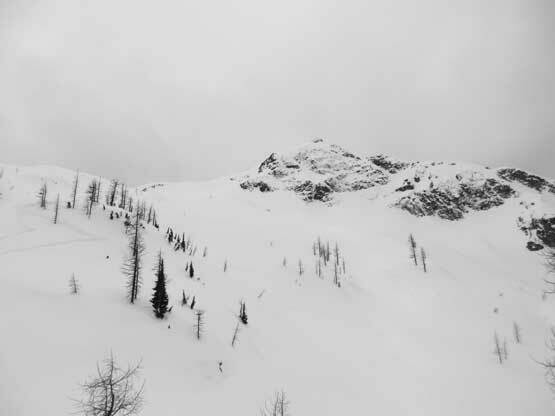 The snow conditions and the previous parties’ tracks had played a major factor. The only downside was the weather but sometimes you just cannot win them all, but other than the weather it’s an excellent trip with friends, as usual.